Ever since Willowbank distillery closed in 1997, New Zealand’s whisky scene has been pretty quiet. However a burgeoning number of craft distilleries are determined to put the country back on the world whisky map, and establish a distinctively Kiwi style. Jake Emen reports. New Zealand’s whisky scene is on the rise. Not for the first time either, but this time it’s being built to last, with upstart distilleries making quality, distinctively Kiwi spirits, and an infrastructure of bars, shops and whisky-drinking consumers in place. Perhaps it’s not a surprise that whisky is finding a home in New Zealand – it’s an island nation with a temperate climate, and a population with a great deal of British roots as a former colony. New Zealand and the United Kingdom are even nearly the same size. Perhaps it was inevitable for uisge beatha to find a home in Aotearoa. As mentioned, Kiwi whisky isn’t a new concept. Willowbank distillery opened in the 1970s and remained in business for over two decades. Seagrams purchased the distillery in the ‘80s though and then sold it to Fosters – yes, of ‘Australian for beer’ fame – which ceased production and sold off the equipment in 1997. There was quite a bit of stock remaining from Willowbank though, and it’s been hitting the market in recent years from the New Zealand Whisky Collection, which purchased some 400-plus barrels. Releases have included well-aged 25- and 30-year-old expressions, vintages from the ‘80s and ‘90s, and a wide-ranging lineup of additional expressions. Thomson Whisky also got in on the fun with 18-, 21- and 23-year-old sourced releases, and is also currently offering Two Tone, aged in a combination of Bourbon barrels and New Zealand red wine casks. That stock won’t last forever, of course. ‘So we either fold up shop or take the brand we’ve established with Thomson and create our own distillery,’ says Sam Holmes, Thomson’s brand ambassador. The distillery opened in Riverhead, northwest of Auckland, in 2014, and is making a name for itself by looking to the future with a line of self-produced spirits rather than continuing to rely on the past. They’re doing so by tapping into a few unique Kiwi twists, including those red wine casks. ‘It’s about creating a hallmark for New Zealand whisky,’ Holmes says. Even more intriguing is the distillery’s use of manuka wood smoke in its Manuka Smoke Single Malt. Most of the world are familiar with Manuka honey, but New Zealanders are well acquainted with the wood smoke as well. ‘It’s used in New Zealand cuisine quite often,’ Holmes says. ‘It’s an ingredient and style every Kiwi understands.’ After some trial and error to get the smoke levels right, the result is a sweeter, more barbecue-style smoke than peat, reminiscent of some of the American whiskies showcasing mesquite smoke these days. The Manuka Smoke Single Malt is one of two ‘progress report’ whiskies from the distillery as it’s still waiting for more of its juice to come of age. The other release reverts back to peat for its smoke, but keeps it Kiwi by using New Zealand peat. The peat is said to be closely similar to the heathery Highland Park peat as opposed to Islay’s coastal supply. Thomson Whisky goes in another unique direction with Rye & Barley, made from a mashbill of 80% malted rye and 20% malted barley, and aged in virgin French oak. ‘It’s very difficult to explain,’ Holmes says with a resigned laugh, going onto call it, ‘an American-influenced New Zealand whisky’. Manuka shows up again at Puhoi Organic distillery, a family operation about 40 kilometers north of Auckland. There, distiller Alex Kirichuk produces an incredibly diverse selection of spirits in a farmhouse-turned-funhouse, stocked with distillation and laboratory equipment. The whisky takes centre stage with Manuka Honey Whisky, matured for three years and infused with botanicals and manuka honey. The family moved to New Zealand in 2002 and also produces products with ties to their Ukrainian heritage, such as oak-aged Starka-style vodka, and spirits ranging from a macadamia nut rum to raspberry amaro, absinthe and limoncello. ‘In our culture, there is no food without drink, and vice-versa,’ Kirichuk says. Despite a micro-sized production, the distillery has lofty goals. ‘We’re targeting to be the best alcohol maker in the world, in small batches,’ Kirichuk says. He’s beginning to build a reputation for himself as well. A recent visit to the distillery happened to coincide with the delivery of a mizunara oak barrel, which was sent to him from a Japanese company looking for his expertise on barrel treatments. Shifting to New Zealand’s South Island, Canterbury is home to Workshops Whiskey. The Lawry family had long been in the beverage industry, but following the 2011 earthquake in Christchurch, shifted gears and got to work on whisky production. They constructed their own distillation system with an 800-litre copper pot still, and then added a second still shortly thereafter. The distillery’s first release, a three-year-old single malt, came to market in 2016. Kiwi identity: As the category grows, will maturation in wine casks define New Zealand whisky? It was his wife Desiree’s idea to create the distillery, and a multi-year planning process ensued, including educational visits to the US and Scotland. ‘It was Desiree’s whole dream, her passion,’ Whitaker says. The dream came to fruition when construction on the distillery began at the start of 2015, with distillation beginning in October of that year. That means the end of 2025 is the absolute earliest you can expect to see any single malt. The distillery has a shimmering set of Forsyth pot stills, with a 2,000-litre wash still and 1,300-litre spirit still. Maturation is being done in a mix of Bourbon barrels and Sherry casks, while New Zealand wine casks are also being incorporated to a lesser degree. An on-site museum dedicated to Cardrona and its history as a once-booming gold rush town is also in the works. ‘We built [the visitor’s center] so people could come and visit, and see, feel, and touch the whole process,’ Whitaker says. 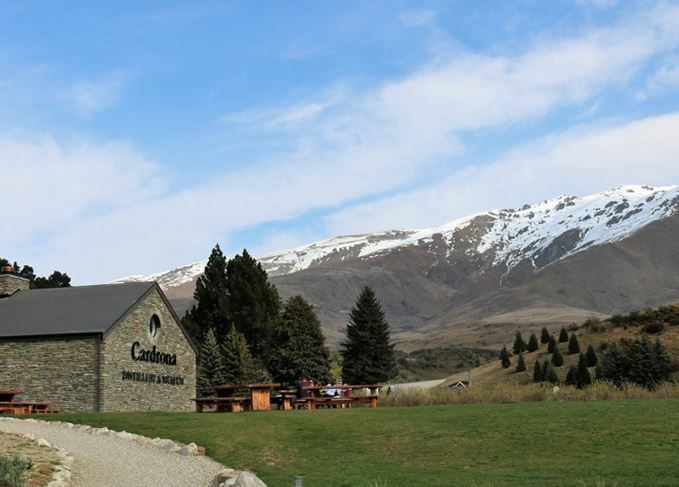 ‘Cardrona is going to be on the rise again.’ The distillery will surely be at the centre of Cardrona’s rise, but even more so should prominently feature in the rise of the entire category of New Zealand whisky.